Mom osprey (far right) and one of her three chicks sure are quizzical. only ten feet to the side and about 15 feet above me. 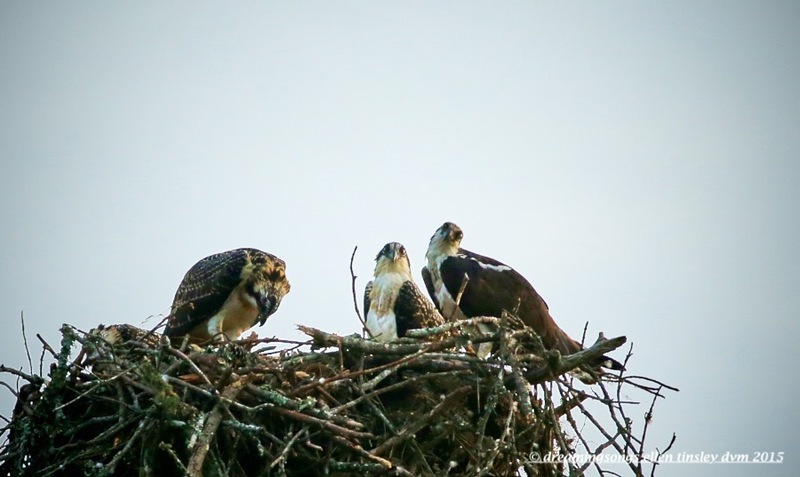 It is said one cannot go back in time – but I am going to attempt it with the Jordan Lake osprey family. I kept an eye on them as I finished watching the fledging of the Jordan Lake eagle family. So, this photo was taken on June 24, 2015 – keep an eye for the dates on upcoming family shots. Posted in birds, Jordan Lake, ospreys of Jordan Lake, photography, raptors, wild birds and tagged as female osprey, immature osprey, Jordan Lake, osprey, ospreys of Jordan Lake, raptor.